Trade Union Solidarity says Discovery has rejected its plea to reconsider its 10% share allocation to black people in the new bank launched by the health and financial services giant this month. Solidarity said it met with Discovery CEO Adrian Gore on Monday to raise its concerns about the "racially exclusive scheme". Gore announced during the launch of Discovery Bank that 10% of the company’s innovative tech-led bank would be owned by black depositors, a move welcomed by industry bodies. "We requested a meeting with Discovery following a huge outcry from our members over the scheme. "Unfortunately, Discovery has insisted that it would maintain the scheme," said Connie Mulder, head of Solidarity Research Institute. "We are disappointed, but can't say it was unexpected." The union said it urged Discovery to reconsider its position on the share scheme and adopt an inclusive metric which would not discriminate against people based on the colour of their skin. The union, whose members are largely white, said it would not prevent its white members who are already Discovery clients from leaving the company in protest against the scheme. It said it had launched an online petition against the scheme. "South Africa already has enough similar scheme which are exclusively for black people… we can’t let this happen," said Mulder. Mulder stated that the union would continue engaging with Discovery on the matter. It's not the first time that Solidarity has locked horns with a large corporate over empowerment shares. 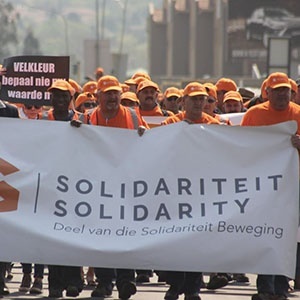 Solidarity previously embarked on a strike at Sasol over its Broad-Based Black Economic Empowerment share scheme known as Sasol Khanyisa phase 2. Sasol has maintained that its system was not exclusionary, describing it as an "important business, social and moral imperative" for the company, boosting share ownership in Sasol South Africa by previously disadvantaged groups. Solidarity has also taken legal steps against the Yes4Youth programme, which is aimed at equipping unemployed youths with skills and support. "It is astonishing that government and the companies that associate themselves with the programme believe it is acceptable to discriminate against the poor in society, simply because the colour of their skin is not right," Paul Maritz, the coordinator of Solidarity Youth, said in a statement. Solidarity said it would take legal action on behalf of one of its members, Danie van der Merwe, who is unemployed and who is excluded from this programme because of his skin colour.